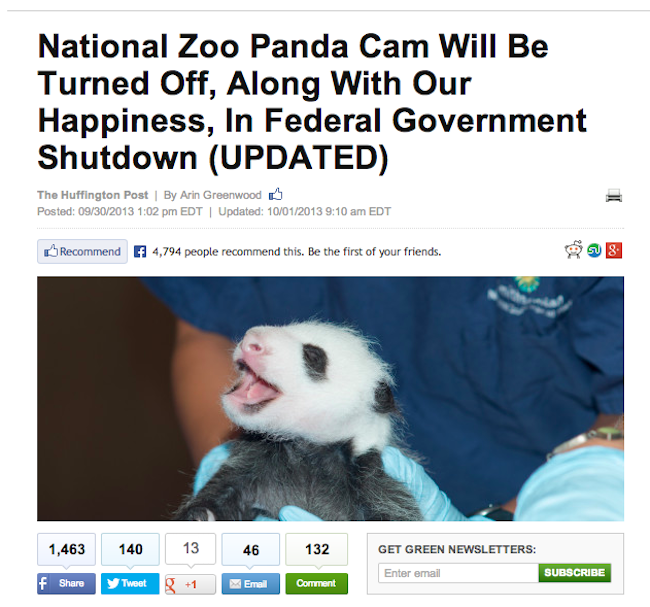 As a massive bureaucracy closes for business, the National Zoo offers a lesson in digital news production. Government shutdown is upon us. Again. And so, again, we'll read stories of the effects of history repeating itself: explainers both extensive and brief, analyses both indignant and less so, straightforward news stories that dutifully describe what happens when a massive bureaucracy suddenly, if only partially, shuts down. Many of these stories will be excellent. Some will not. But a significant portion of them will look, as they tell their stories, for the journalistic equivalent of a continuing resolution: a central character or event that will drive their stories forward. An element that will "humanize" the shutdown saga, illustrating the microcosmic consequences of the macrocosmic event that is the federal government of the United States closing its doors for business. The most obvious candidates for that role: the more than 800,000 federal workers who don't know, at the moment, what their financial future will hold. The women and children who rely on WIC for nutritional supplements, and the seniors who rely on federal grants for the same thing. The astronauts of NASA, circling us in space. The 48 people who have spent months planning October weddings that were scheduled to take place on the National Mall. Etc. So why humanize stories with pandas, instead of actual humans? 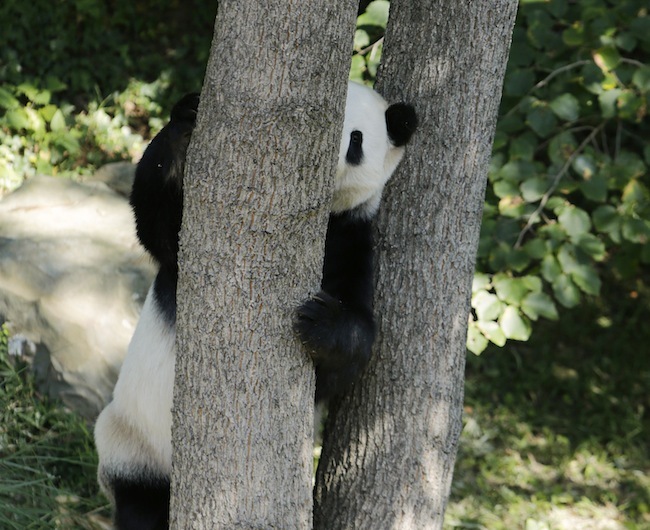 Part of it is the fact that pandas are adorable and awesome and just what we need to forget, for a moment, about the political dramas playing out on Capitol Hill. But part of it, as well, likely has to do with the biases of news consumption as it takes place in the digital environment. We turn to pandas in a crisis like this, essentially, because there's not much else we can turn to. Adorability is only part of pandas' appeal; their political neutrality, at least on the surface, is another. Let's go back to 2010, and to the book News at Work: Imitation in an Age of Newsroom Abundance. In it, the Northwestern communications professor Pablo Bocszkowski shared the results of his research into people's news consumption patterns in the workplace. One of his findings: When it comes to actually talking about the news -- one of the big motivators for news consumption in the first place -- coworkers tend to shy away from politically tendentious topics. Which is understandable: The workplace tends to collect people who might otherwise have little in common into close quarters. Why rock the boat? tends to steer people away from the consumption of politically sensitive topics, and move them towards consumption of sports stories, stories celebrity stories — topics that are more innocuous, and lighter in terms of workplace conversations. Which brings things back to where things will always end up, eventually: cute-and-cuddly pandas. The shutdown is, at its core, Platonically political: It challenges Americans' fundamental beliefs about what the government is and should be. The ACA, the particular programs being compromised, the moms and kids and grandpas affected by the shutdown … those aren't just programs and people. They are also, in the context of the shutdown, allegories for distinct political philosophies. Which means that they are, in the workplace -- the place where many Americans consume their news -- sort of awkward to talk about. Actually, they're extremely awkward to talk about. You know what's not awkward, though? Pandas. Adorable, frolicking pandas. Who may be, yes, the most non-essential of non-essential government workers ... but who are also, in Bocszkowski's terms, "innocuous" and "light" and political only in the vaguest possible way. 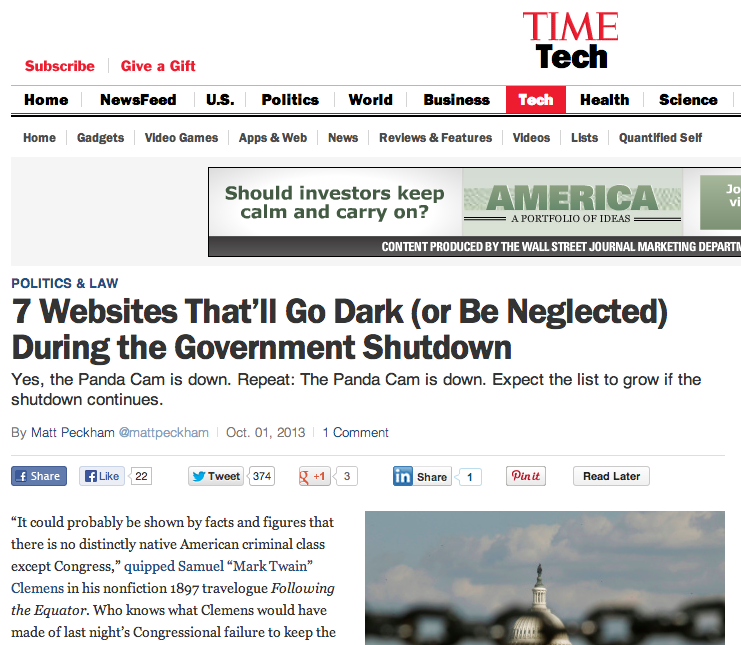 Pandas allow people to talk about the shutdown news by providing a cover of neutrality and adorability. It can't be political when it's panda-full! This just got REAL. 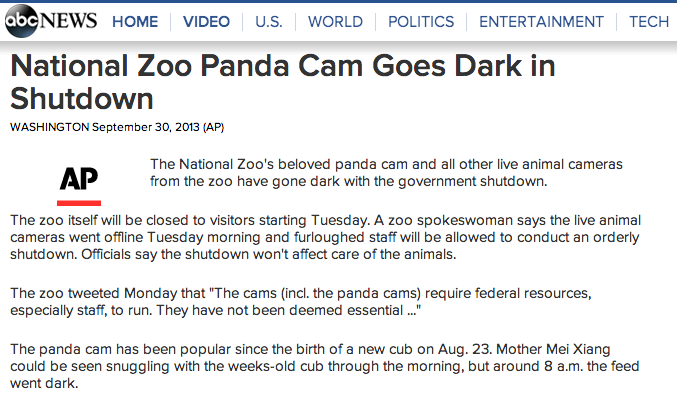 MT @NationalZoo: Yes, during a #shutdown, even the panda cam won't be broadcasting online. We get, in other words, stories that are optimized for workplace consumption -- and stories that are, more to the point, optimized for the digital sharing environment in general. These are not bad stories, to be clear. They're often fun. They're often informative. They're often quite adorable. But what they are in addition to all that is doing double duty: They're avoiding all the pitfalls Bosczkowski describes while also informing people about the news of the day. They're reporting on current events, while they're also encouraging people both to care about and to share about those happenings. They're having it both ways -- the ways in this case being "politics" and "panda." The stories leverage their knowledge of that other hugely complex bureaucracy -- the sharing economy -- to create stories that people will want to, and feel at liberty to, discuss with each other. Stories that are both black and white. Stories that are both cuddly and substantial. Stories that are, in their way, just like pandas.